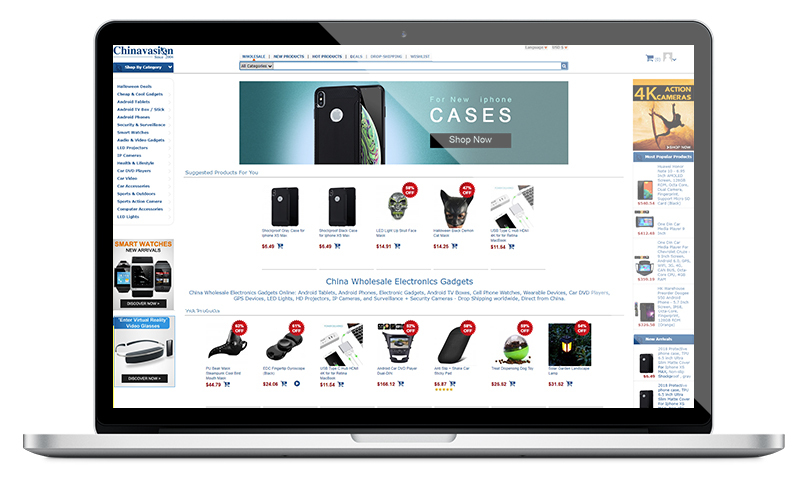 Chinavasion, founded in 2004, is one of the best e-commerce platforms. Now it has become a part of Yantai Lanlei Network Technology Co., Ltd. We mainly engaged in cross-border E-Commerce and is committed to providing retailers and wholesaler with high-quality products as well as professional customer service. Why Start a Business in China? China is the world's largest manufacturing nation,with offering customers low-price and high-quality products. We strive to invade the world with best of the Chinese electronics, to be a bridge that connects China with every corner of the world and to spread the word that we are Reassuringly Different!That's how the words China and inVasion came together to become ChinaVasion! What are Chinavasion’s Main Tasks and Key Objectives? Although we started as an electronics hub for serving both B2C and B2B customers, our attention has now moved towards business-to-business customers (B2B). We are working hard to improve our systems to meet the requirements of B2B customers offering them a trusted partner in China for all their electronic gadget needs. Hence, here we'd like to introduce our core beliefs and major goals. We are a customer-oriented company and one of the leading strategic suppliers of high quality electronics & gadgets from China offering fair prices and excellent service. We are striving to be the world’s leader in selling high quality electronics and gadgets from China by offering excellent and reliable services. All our products are brand new, top quality electronics from top Chinese manufacturers. Our in-house quality control team carefully tests our wide selection of consumer electronic products with quality in mind. That is why we are a gadget supplier that is capable of delivering Western quality standards at wholesale prices. Besides product quality, we are strongly focused on delivering an excellent service. We offer you complete before and after sales service. Our polite, professional team of customer support staff is available on live chat and email to answer your enquiry's within 1 working day. Thanks to our in-house QC engineering team, with in-depth electronics product knowledge, we are capable of offering a full 3 month warranty on all our electronic products. Read more about Chinavasion services at this page. You might also visit our Dropshipping Page, Shipping Information Page, or Support Area for general questions. If you have questions, suggestions or concerns, we’d love to hear from you. Submit a ticket in our support centre. Our friendly support staff is 24/5 available. Click here to start a live chat. For business inquiries on bulk orders, you can also contact us by clicking the button below. We would love to meet you. Simply contact us through the above methods to arrange a time to visit us in China.